As lawyers, our natural instinct is to solve problems. Resolve disputes. Find what is broken in the law and society and drive positive change. We identify needs, and we address them. 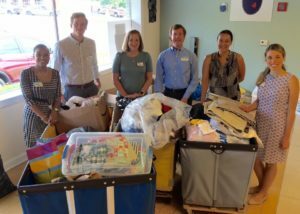 In a powerful way, the driving forces behind the Raleigh nonprofit Note in the Pocket are doing all of this and more. The need they identified is the staggering number of Wake County children who qualify for free and reduced lunch, who lack clean clothes to wear to school, and whose families are drastically under-resourced. Note in the Pocket has addressed this need by starting with one deficiency and engaging the local community to cure it. The effort behind Note in the Pocket began to take shape in 2005, when a young kindergarten teacher noticed the distressing number of children in her class who were not appropriately clothed or fed. In particular, she noted that in the winter months many of her students showed up to school with the same threadbare, short-sleeved shirts day after day. She resolved to choose one basic need and then find a cure: to provide clean, warm clothing for each and every student. With the help of her family, she promptly began by purchasing coats from thrift shops to send home with the children. After many families sent the coats back to school under the impression they were simple loaned for the day, the school’s social worker slipped notes in the coat pockets, explaining to the families that the coats were provided by the community and were gifts for the children to retain. Through these efforts, Note in the Pocket was born. This teacher’s act of kindness quickly grew to encompass all kindergarten classes in the school. Eventually, every child in the school received a winter coat before the cold weather set in. Each coat came with a “note in the pocket” indicating that the coats were gifts for the children to keep. The ministry eventually expanded by word of mouth and in 2011, the current executive director was appointed to streamline the collecting, processing, and distribution of donations. Throughout the next several years, Note in the Pocket took on its current form: a 501(c)(3) with its own facility that services all 177 public schools in Wake County. Note in the Pocket, or “NITP,” now works with the Wake County Public School System social workers and 12 other agencies, including Family Promise and the Salvation Army. In 2016, NITP served a total of 3,875 people, distributing a staggering 90,224 pieces of new or like-new school appropriate clothing to families from Fuquay-Varina to the northernmost corner of Wake Forest. With each bag of clothing, NITP volunteers include a simple note that reads “you are loved,” reminding recipients of their local community’s support and care. For more information on Note in the Pocket, to learn about upcoming events, and to discover opportunities to volunteer or donate, visit http://www.noteinthepocket.org/.